Last week, Republicans in the House of Representatives released the American Health Care Act (AHCA), draft legislation that is intended to repeal and replace the Affordable Care Act (ACA). APA responded within 24 hours with this press release. As Congress deliberates how this and other proposals will impact access and coverage, it is crucial to ensure the gains that have been achieved for individuals with mental illness and substance use disorders are preserved and expanded. Join the APA and your fellow psychiatrists in urging Congress to protect mental health care. Go to the APA Action Center and enter your zip code in the box. Draft text for your representative is provided, which you can easily edit and send. In terms of background, the proposed legislation has passed the Energy and Commerce, Ways and Means, and Budget Committees. The bill is expected to come to the floor of the House for a vote early next week and then move into the Senate. APA will be closely monitoring the situation and may further engage members to contact their Congressional representatives based on how the process unfolds. Overall, APA continues to work in a bipartisan manner with key House and Senate leaders to improve the way our federal government finances and manages mental health services, especially for patients with serious mental illness and substance use disorders. Thank you for being an APA member and taking time out of your busy schedule to participate in this effort. Transgender children are already at increased risk for violence, bullying, harassment, and suicide. They may be more prone to depression and engaging in self-harm. These children need acceptance and affirmation, not stigmatization. Policies excluding transgender youth from facilities consistent with their gender identity have detrimental effects on their physical and mental health, safety, and well-being. The American Psychiatric Association supports laws that protect the civil rights of transgender and gender variant individuals. The APA also opposes all public and private discrimination against transgender and gender variant individuals in such areas as health care, employment, housing, public accommodation, education, and licensing. The APA Position Statement on Discrimination Against Transgender and Gender Variant Individuals can be found here. The deadline to apply for all APA/APAF fellowships is Monday, January 30th. For more information, please visit www.psychiatry.org/fellowships. If you have any questions, please visit the FAQ section or contact Tatiana Claridad at [email protected]. The 2016 – 2017 recruitment season for APA/APAF Fellowship applications is open. Applications will be accepted through Monday, January 30, 2017 for any of the eight (8) APA/APAF fellowship programs (APA/APAF Leadership, Child and Adolescent Psychiatry, Diversity Leadership, Jeanne Spurlock Congressional, Public Psychiatry, Psychiatric Research, SAMHSA Minority and SAMHSA Substance Abuse Minority Fellowships). Learn more. I am glad to announce the selection of the new Executive Director of the APA Foundation, Daniel Gillison. Dan joins the Foundation coming from the National Association of Counties (NACo) where he was the National Director of County Solutions and Innovation. In his role, he led corporate and philanthropic fundraising efforts and directed the educational programming of the NACo Research Foundation. During his time at NACo, the corporate support increased from $800K to $1.8 million, while strengthening the brand, and increasing the footprint of private sector involvement. In addition, the Foundation was able to expand its educational offerings in mental health and criminal justice after securing new grant funding from foundations. Dan also has the strategic planning experience to guide the APA Foundation into its next chapter. We thank the Selection Committee consisting of Drs. Maria Oquendo, Paul Summergrad, Bill Resnik, Donna Morris, Frank Brown, Louis Kraus, Richard Harding, Steven Sharfstein, Stuart Yudofsky, U.K. Quang-Dang, Mr. Steven Leifman and Mrs. Maureen O'Gara Hackett, who voted unanimously for Dan. The APA Foundation Board voted unanimously in his favor as well. Daniel will be attending the APA Foundation's fundraiser at the Georgia Aquarium on Saturday the 14th, from 7:00 to 10:00 pm. He will also attend the APA Board of Trustees Luncheon on Sunday the 15th. I hope you will join me in attending to welcome him to the organization. American Psychiatric Association (APA) to Offer Training! APA is pleased to announce a new opportunity for psychiatrists interested in opportunities to advance integrated care. In September, the Centers for Medicare and Medicaid Services (CMS) launched the Transforming Clinical Practice Initiative (TCPI) and awarded $685 million to 39 national and regional healthcare transformation networks and supporting organizations to support practice transformation through nationwide, collaborative, and peer-based learning networks. As a TCPI Support and Alignment Network (SAN), APA received $2.9 million over four years to partner with the AIMS Center at the University of Washington and train 3,500 psychiatrists in the clinical and leadership skills needed to support primary care practices that are implementing integrated behavioral health programs. Once psychiatrists are trained (see below), APA will work to connect them with local Practice Transformation Networks (PTNs) participating in TCPI. ***Free training is available to psychiatrists through online modules and live trainings. CME credit is also offered. Content is similar for both training sessions so you may choose to participate in one or the other based on your learning preferences and availability. Online Modules - Get started! There are two parts to the training containing seven modules in all. It is recommended that participants complete both parts 1 and 2. IPS: The Mental Health Services Conference – Registration opens Spring 2016. Check back at www.psychiatry.org for meeting information. Stay up-to-date on TCPI and APA's Support and Alignment Network at www.psychiatry.org/sansgrant. If you have questions, contact Ashley Rutter, Program Manager at [email protected]. The membership of the American Psychiatric Association has chosen Anita Everett, M.D., as its next president-elect. The results were made public today, but are not official until the APA Board of Directors confirms the election at its March meeting. Everett is currently division director of Johns Hopkins Community and General Psychiatry, Bayview Campus, and associate professor in the Department of Psychiatry and Behavioral Sciences at Johns Hopkins School of Medicine in Baltimore, MD. She is also president of the American Association of Community Psychiatrists. Everett has held numerous leadership roles at APA, including trustee-at-large on the APA Board of Trustees; chair of the APA Task Force on Healthcare Reform 2015; chair of the Scientific Program Committee of the Institute on Psychiatric Services; Assembly Representative; and chair of the Council on Healthcare Systems and Finance. She has also served as president of the Maryland Psychiatric Society. Her term as president-elect of the APA, once confirmed by the board, will begin this May at the conclusion of the APA Annual Meeting in Atlanta, when current President-Elect Maria Oquendo, M.D., begins her one-year term as president. The American Psychiatric Association is a national medical specialty society whose more than 36,000 physician members specialize in the diagnosis, treatment, prevention, and research of mental illnesses, including substance use disorders. Visit the APA at www.psychiatry.org. Voting for the 2016 APA Election is now open! Do your part in selecting the next leaders of the APA. Visit their website to view the slate of candidates, election guidelines, voting eligibility, and to vote! Voting closes on February 1, 2016. The Affordable Care Act (ACA) now requires all ordering, prescribing or referring physicians to be enrolled in the state Medicaid program (42 CFR 455.410). Traditionally, most providers have enrolled in a state’s Medicaid program to furnish cover services to Medicaid recipients and to submit claims for these services. Now, the ACA requires physicians to enroll in the Medicaid program to order, prescribe and refer items or services for Medicaid recipients, even when they do not submit claims to Medicaid. This new enrollment requirement does not mean providers must see Medicaid patients or be listed as a Medicaid provider for patient assignments or referrals. Rather, the ACA requires providers to enroll only to meet new ACA program integrity requirements designed to ensure all orders, prescriptions or referrals for items or services for Medicaid beneficiaries come from appropriately licensed practitioners who have not been excluded from Medicare or Medicaid. This new requirement is only applicable to physicians who order, prescribe or refer items or services for Medicaid beneficiaries. Physicians who are already enrolled in Medicaid as participating providers and who submit claims to Medicaid are not required to enroll separately. Finally, it is important that providers understand the consequences of not enrolling in Medicaid. If you are a physician that does not enroll in Medicaid then, other physicians, practitioners and facilities who actually render services to Medicaid beneficiaries based on your order, prescription or referral will not be paid for such items and services. can continue to see Medicaid patients without billing the Medicaid program. Failure to enroll will result in your orders, prescriptions and referral for Medicaid patients not being accepted or paid. If you have any questions, please contact Maureen M. Bailey at 703-907-7399 or [email protected]. 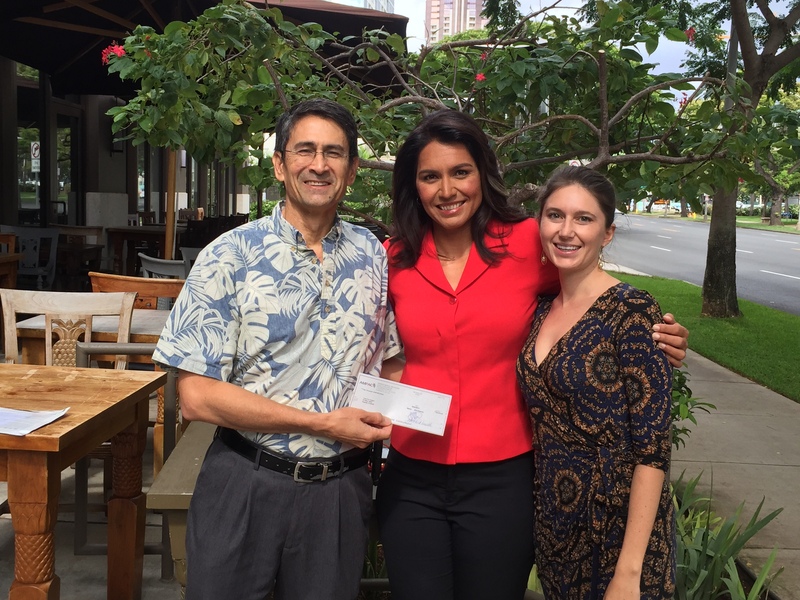 Dr. Akaka delivering a check for $2000 from the American Medical Association Political Action Committee to Congresswoman Tulsi Gabbard (D-HI) on October 30, 2014. Dr. Akaka has known Congresswoman Gabbard for years, first meeting her when she was working in Senator Daniel Akaka's Washington DC office, where they first discussed legislation to improve the nation's mental health, particularly in Veterans. At Congresswoman Gabbard's left is Lauren Zirbel, lobbyist for the Hawaii Medical Association.